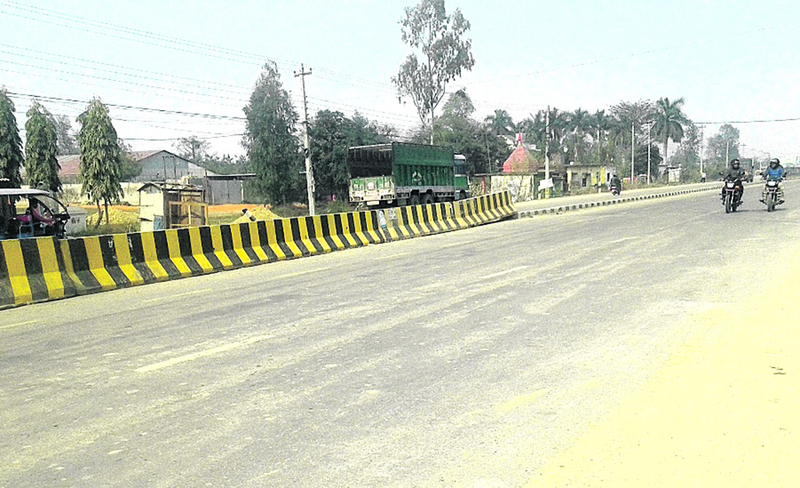 NEPALGUNJ, Feb 18: Dividers are placed on roads to regulate traffic movement. In Nepalgunj, however, it does not seem so. Except for a few places, newly added dividers on the city's main four-lane road are placed so haphazardly that they now pose threat to road safety. Before being placed on road recently by the office of Nepalgunj Sub-metropolitan City, these dividers were left unattended at the roadside for a time long. The office had placed the concrete dividers after holding consultations with relevant authorities but still failed to set them properly. They have been placed haphazardly instead of placing them in a singular row. Locals have shown concern for the hazard it posses to vehicles that ply on the road. “Those dividers were left unattended at the roadside for a long time. Even though they did finally placed them, they have placed them in such a way that the dividers are now actually more likely to invite accidents instead of averting them,” said Jagadish DC, a local of the city. “There are no street lights. For motorists travelling in the night, these dividers have made the road more prone to accident,” he added. He argued that by placing the dividers at uneven distance, motorists would violate traffic rules and cross lanes through the gaps. Such behavior, he claimed, will invite more accidents as vehicles speeding from other direction would not anticipate such actions. “Let alone at night, even during the day time, such placements of road dividers can cause road accidents,” he said. While welcoming the move to divide the road lanes, he called on authorities concerned to arrange them properly. “They have to figure out the optimal distance between two dividers and then place them accordingly. They should consult road safety experts and engineers while doing so. After all this road is the main road of our city,” he added. Locals assume that the metropolitan office has not sought advice from experts regarding the placement of dividers. The office is working in coordination with the traffic police alone, they say. “This has made things messy. Cyclists, commuters, drivers, riders, none are safe,” DC commented. Apart from the haphazard placements of the dividers, locals also pointed to the lack of zebra crossings and over-head bridges along the four-lane road. They urged the road department and metropolitan office to do the needful for making the roads safer for motorists and pedestrians. Apart from the haphazard placements of the dividers, locals also pointed to the lack of zebra crossings and over-head bridges along the four-lane road. “Reflectors should be placed on the dividers and accident-prone places along the road. Zebra-crossings and over-head bridges should be made for making the roads safer for the motorists and the pedestrians,” said DC adding that in lack of reflectors, some motorcyclists have failed to notice the dividers and crashed head-on. Ishwor Gyawali, another local resident, also stressed on the need to involve road safety experts. “It is a positive step that dividers are being placed on road. But they have to be placed properly. Or else instead of safety, they become hazard,” he said. Gyawali added that every road infrastructure has to meet certain standard. Road safety measures should be put into place depending on the width and curves of road. The Raanja-Jamuhana section of the four-lane constructed by Papu Construction Company, is in a dilapidated condition. Locals accuse that the construction of the road has been substandard and that the company delivered the city very poor road. “There are certain things which we can fix even later. However, you cannot fix everything later. The road has been constructed in such a way that motorists are able to cross the lane at will and this has affected the safety of the road,” Gyanwali claimed. The Sub-metropolitan's office said that the dividers have been placed on the basis of the recommendations put forward by the District Traffic Police Office. “Who else than the Traffic Police Office would be appropriate to coordinate with for placing the dividers?” asked the city's Mayor Dr Dhawalshamsher Rana. “They are the ones who work at the front line and ensure road safety.” Rana further said that his office assisted the traffic police in making the roads safer. Hom Thapa, chief of the District Traffic Police Office, however, claimed that the dividers have to bring down the number of accidents on the road. He informed that his office would continue to review the safety of the road and continue to add more dividers in the days ahead also.